You’ve finally graduated from college, and you’ve got a few interviews lined up.. But are you ready for them? Especially in this tough job market, every detail matters, no matter how small! Everyone knows that first impressions matter. So bust out your Sunday’s best and dress to impress! But what about your watch? As someone who used to interview people in my former life, it always surprised me how many guys showed up rocking Casio G-Shock watches. What’s the point of wearing a $500 suit if you’re going to ruin the image with a cheap watch? You don’t have to break the bank on a watch.. There are plenty of Timex watches out there that will do the trick just fine. But if you’re looking for something with a little more style, you’ve got to check out www.manbushijie.com. 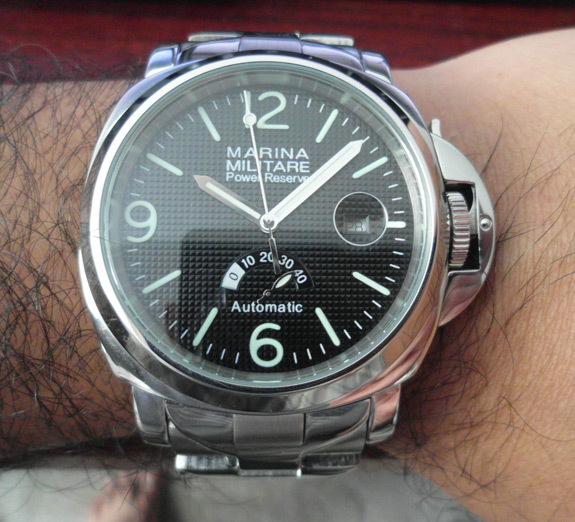 Here’s the 44mm Marina Militare Stereoscopic Dial Power Reserve Auto I got from them. It’s very similar to my old Panerai Luminor Marina PAM 209.. Only it didn’t cost me $6000. The cost? A little over $100! If you like the “Pan-style” look but don’t want the hefty pricetag associated with it, the Marina is a great option. It’s not a replica, but rather an homage to the storied brand. The movement of the watch is smooth and the overall look is really sweet. Overall, this is a great looking watch at an unbelievable price. The watch shipped very fast, and it was packed in a styrophone box with additional bubble wrapping around the watch. Manbushijie has a great selection of watches, just take a look around their website!